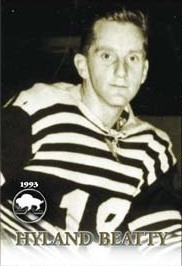 Born in Winnipeg, Hy Beatty played his Junior hockey with Winnipeg Monarchs. He was part of the team that took the 1946 Memorial Cup championship. He later played Senior with the Winnipeg REO Flyers and with the Winnipeg Maroons. For 15 years Beatty was a referee in the MJHL, WHL and OHA. He was Referee-in-Chief of the MJHL and the Greater Winnipeg Minor Hockey Association, and also the President of the MJHL. He also officiated in Canadian Amateur Hockey Association (Hockey Canada) playoffs.